It was a beautiful October morning back in 2014. I was on my way to work for the first time. I was nervous and excited. I had a cup of coffee in my hand and head full of questions and hopes, you know – the usual on the way to your new job. A series of loud caws stopped me in my tracks. I looked up and this was the first time I met Mr Crow. He looked like an ordinary crow, and yet there was something very much extraordinary about him. I said “Hello”, he “Cawed” back. I thought it nice and polite and went further on my way. The next day similar thing happened, so he got me curious. I stopped and investigated the tree he was perched on and all of that underneath his inquisitive gaze. 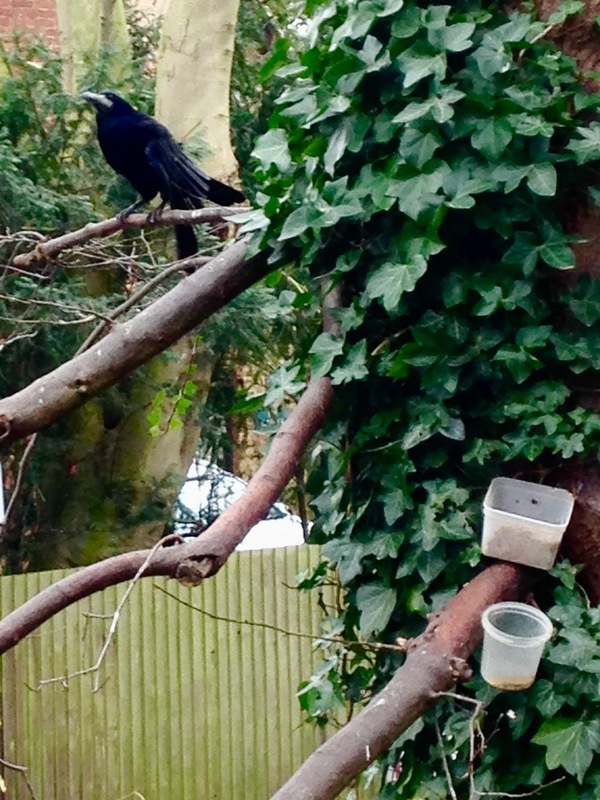 I’ve noticed that somebody assembled a little feeding area on the tree, with a plastic tray for water and a little container for food. They were both signed “Mr Crow”. 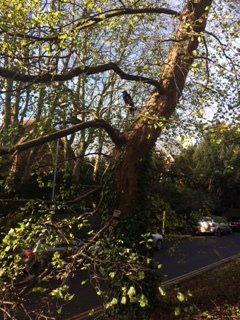 “Hello, Mr Crow” I said, and he “cawed” back politely. That was how my adventure with this incredible creature truly began. When I got back home I delved into an internet wisdom of the mysteries of a crow’s diet – meet scraps, cheese, egg yolk, sunflower seeds, peanuts and – something that became my signature dish with him – dry cat food. I thought that Nemrod, my cat, won’t mind sharing, so on the third day I went to work equipped with a little bag of cat food. After usual greetings I emptied it with a patter into his container and this patter became our secret sign of recognition. From that moment every day on the way to work I took his favourite cat food and spent a few moments with him underneath his tree. 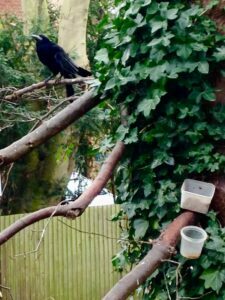 Although, I believe he could recognise me long before, the pattering of food into his container always made him come down the tree. After some time we tamed each other enough that he was down on the branch before I had time to move away. I introduced Mr Crow to my family (obviously with the exemption of Nemrod the cat). As it happened, although there was no need for me to go to work, on many cold, wintery Sunday mornings we were venturing with my son, braving the elements to deliver Mr Crow’s breakfast. He always welcomed us with the familiar “Caw, Caw, Caw”. I suppose feeding birds, especially in winter, is a noble yet usual thing. So what made Mr Crow special? He was a flightless bird. His wing broken and healed flopped down onto his side. Although sky had its limits for Mr Crow, he was an exceptional hopper and glider. I wouldn’t believe it if I wouldn’t have seen it with my own eyes. Observing him, being present in his world for all these years allowed me a glimpse into his habits. He made his home on the flat roof of the building neighbouring with his tree. He glided from the roof onto the branch. Then hopped all the way down the tree, from branch to branch, to his dining quarters, and if the circumstances were favourable all the way down – to scare the sleepy and slow earthworms which juiciness he could spot from his skyward apartments. The tree he was living on was a perfect tree for that – with its long arms caressing the ground. Then on the way back he hopped to the top of the tree and then glided back to the roof. I never knew what had happened to Mr. Crow’s wing. But truly it didn’t matter, as he inured his new way of living and simply made the best of it. With his charm and taming techniques he secured himself a whole group of followers, unafraid to face the elements, the seasons, and early times of the morning – I called us Mr Crow’s crew. I had the privilege of meeting two of them at some point over my almost 4 year journey with Mr Crow; but I’m sure there must have been many more to sustain him throughout all these years. Mr Crow was a big presence in my life. Together with my son, we often imagined how his life looks when there is nobody around to see. How his sky-high apartment looks like, does he have a roof garden and hidden Ninja skills – you don’t need much for the imagination of a 9 year old to roam far and wild. I loved everything that Mr Crow has brought into our lives with his presence. Then one day in January this year I didn’t see him. Then January blended into February and still no-show. I was bringing food to the tree dining area every day, and because each day the tray was empty I carried on. 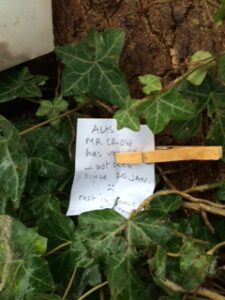 Today I found a note attached to the tree: “Alas! Mr Crow has vanished – not seen since 20 Jan. Rest in peace Mr Crow”. 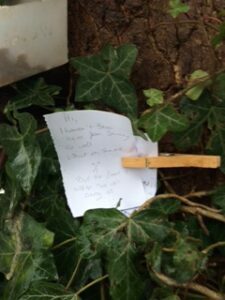 I promptly answered with another note and attached it to the tree: “Hi, I haven’t seen him from January as well. What a shame. But the food is eaten so will carry on”. I was thinking about Mr Crow all day at work, about him and all the people that got involved in his life. 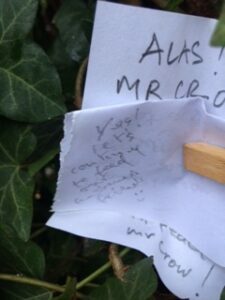 On the way home I passed next to the tree and found another note: “Yes! Let’s continuing to feed our feathered friends”. I think this is exactly what I’m going to do. Although Mr Crow as we knew him is no more, the food we were leaving for him sustained many more creatures. So we will continue to support this habitat. It saddens me greatly to think that Mr Crow is gone, but it also gives me hope that his spirit can roam freely through the skies. He left a great legacy I think – legacy of people coming together and without even knowing each other creating a community. His legacy speaks about noticing the world around us (which is so easy to forget when we walk with headphones silencing the living world; it is so easy to forget to listen, to forget to see). Mr Crow connected separate individuals not only to nature but also to each other, creating a community of likeminded people. This amazing creature came into my life during an important transition point – my first day of work. He left my world together with my Grandfather, marking the end of a generation, the end of a certain era. What is his lesson for me personally? He taught me to look and see; to trust; to have compassion; to tame and be tamed; to imagine; to fight; to survive; to believe that others will notice and that help is possible if you ask for it; that you are never alone (even if you think you are or you cannot see the other person); to let go; to move on; that transitions are important rites in our lives and we should mark them with respect and kindness for ourselves (and others); that there is still so much beauty and goodness in the world (even if media are trying to prove otherwise); and that there is beauty and wilderness behind our front gates – you just have to venture out and notice. Thank you for all your lessons Mr Crow. REST IN PEACE OR FREELY ROAM THE SKIES!